Android Revolution | Mobile Device Technologies: First custom ROM based on HTC Sense 5.5 is out for HTC One! First custom ROM based on HTC Sense 5.5 is out for HTC One! Yes, here it is! The one you've been waiting for! 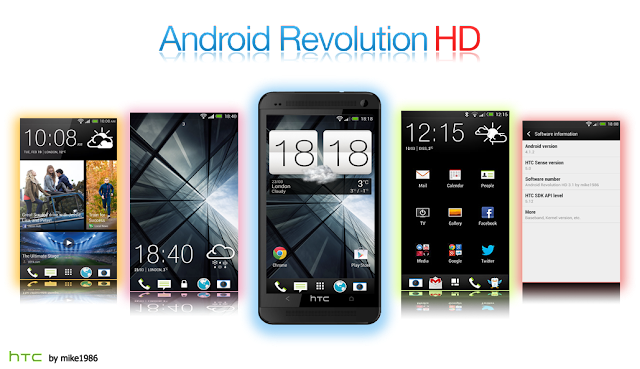 Android Revolution HD 30.0 is the world first custom ROM for the HTC One based on Android 4.3 and new HTC Sense 5.5 UI. Just grab it from downloads section! Anyone else having a hard time getting to the XDA site??? Dang it Mike.. You just put out 22.1 and I just installed it last night!!!! Haha can't wait to get home and dl this beast!! This makes sense, "It looks like we're currently overcapacity. Please try again in a minute, or check out the latest news over on the XDA Portal"
Can we dirty flash over 22.1 ??? I know that same base it's possible, but this is same base ??? I've got a huge problem, after that, my phone is not able to boot and i cant access to recovery mode ! Please someone help me ! Anyone have the MD5? I was able to download it, but I've been burned too many times by not checking it. What about HTC One X? Any chance this fixes the bluetooth issue with Ford SYNC? Ever since I updated the stock ROM to 4.3 I've been forced to manually connect the phone through the truck each time I get in it! It used to just automatically sync up when I started the truck. I had issues until I did a system reset on car. Sorry for the NOOB question, but If I'm currently running the GPE ROM I can just install it the same way I did the GPE ROM correct? basically wipe data, wipe cache, install from Zip, correct? I get android process media error all the time using 30.0. Reverted back to 22.0 and all runs fine. You need to flash 30.0 with full wipe. Mike, my question is.. I have T-Mobile stock 4.1.2 rom, now if I flash with this rom will I loose lte and all past T-Mobile updates? I lost the lock screen sector in the personalize menu. It is just me or do I have to do a full wipe? Ive installed 30.0 over 22.0 without fully wiping it, works fine, thanks revo hd! Although i cat find how to take a dual picture?? Its not in caera settings? I'm currently having some db problems so md5 might be different. This should be fixed within 1 hour. Ah thanks Mike .. I couldn't find it ... but Cristian up above provided it for Zak and I didn't notice !! getting slow in my old age .. doh ! Whichever, my d/l was definitely corrupt then :) do it again Kevin :P !!! It's not recommended to judge battery life after that short time of usage. Give it few full charging cycles and your battery life should improve. cant add additional email account. 3 dots menu not working. Everything works just fine here. Must be some problem on your side I believe. Did everything from scratch. When adding additional email accounts, nothing moves when you click on the + sign or the 3dots although color changes to blue when pressed. Same goes to composing new email. Tried Maximus HD 20 Rom with 4.3 and sense 5.5 same issue. Downgraded to Maximus HD 14 with 4.3 and sense 5 works perfectly. So sense 5.5 is still buggy. Been reading other posts online stating that sense 5.5 has some issues. Wanted so bad to try your Android Revolution Rom. Would be nice if you have version 30 but with sense 5.0 only but nowhere to be found from your download page. Mine is HTC One stealth black 32gb. "3 dot menus won't work when animation is disabled in Developer's Settings." If something doesn't work on ARHD 30.0 that could mean it's the issue in the original base. Sense Toolbox needs few fixes to work properly with new HTC Sense 5.5. Dual Camera is disabled by HTC. You got this on up and running quick! Awesome job man. hey mike. i really like this rom. its so smooth and fast. how ever, i was wondering if there was an option to disable the automatic disabling of mobile data while on wifi?? i want the mobile data icon to show even when im on wifi. i have unlimited data so it's not a problem for me to have it on. is this built into the rom or is there an option i just havent found yet? I installed this over 22.1. i get a couple error messages. "unfortunately sense has stopped working" , "unfortunately android.media has stopped working" rendering it inoperable. I reverted back to 22.1. Is there a work around this without having to wipe and clean install ? The only workaround is to follow instructions and flash again with full wipe. I am having the same problem, I am coming from ARHD 13.3 and when I flash, after a full wipe, I keep getting the same errors every 3 seconds. I am getting the error as well. Can there be nothing done about it? Hi Mike, i could not find lock screen style in personalize sfter upgrafe to 30.0 and no restart option to recovery. Did you saw the release of http://rumrunner.us/ ??? This tool is suposed to S-OFF HBOOT 1.54 which is my case. Do you think I may be encounter problems using this tool with ARHD 30? I post here the results! On stock it worked like a charm! Instaled 3.57.401.500-custom.zip from your repository with RUU. does this fix the camera problem, the purple flare? Doesn't fix for me. I think it will be fixed with newest firmware, not ROM. Because this is how it works on custom ROMs. Will he port over wifi calling for a TMOUS version, when HTC releases the 4.3 update this week? the original emoticons are replaced with boring ones. Is there a way to put the old ones back ? I did a clean install. wiped everything. When I click on a news feed, it just hangs.I can hit home and back out of it. I can refresh, it updates. I just cant open the articles. Any suggestions ? HD Rev 22 is better as 30. 30 is full of bugs. 30.0 has 0 bugs if you flash it correctly. How to change the boot animation on this rom HD 3.0 sense 5.5. I have tried a few times to flash a google 4.3 animation but it does not work. Anybody knows any tricks? thank you all! Anyone know why the disable app drawer clock and 6*5 grid don't work on the sense toolbox ? Do you have xposed updated and sense toolbox enabled? I am coming from the maximus Rom and I flashed the android revolution hd but when I check on the phone info it still says maximus , Any idea why? Flash again with full wipe. Also would be good to wipe your SD card. the download link no longer available, please put it back. The download link for "Download Android Revolution HD 30.0" doesn't work anymore. The mirror is gone. It'll be great if it was up again as I would really like to have try out this ROM. How do i turn the usb debugging on now? Develoer options seem to be gone!? New to flashing roms. Can flash the Android revolution to my Verizon HTC one? Any help would be appreciated. Can i install it on the one xl ?